FILLING: A huge amount of salt beef. I went for the ‘bigger beef’. A smaller serving is available at £8.75, although that isn’t actually small, either. Also American mustard, and mixed pickles. PROS: All the pros. The challah roll is just sweet enough, just sturdy enough, and just about big enough, so it struggles a little to accommodate all that glorious meat. There are rye options, but they do far too good a job of containing everything and I prefer to pick up the spillage with my mustard stained mitts like a feral. Also, it’s tastier and it’s SHINY. Oh and it’s made by a Jewish baker who bakes it only for them. Just get the challah, guys, okay? Oh, the beef! So soft, with lovely edges of fat. Just like me. They make it themselves. 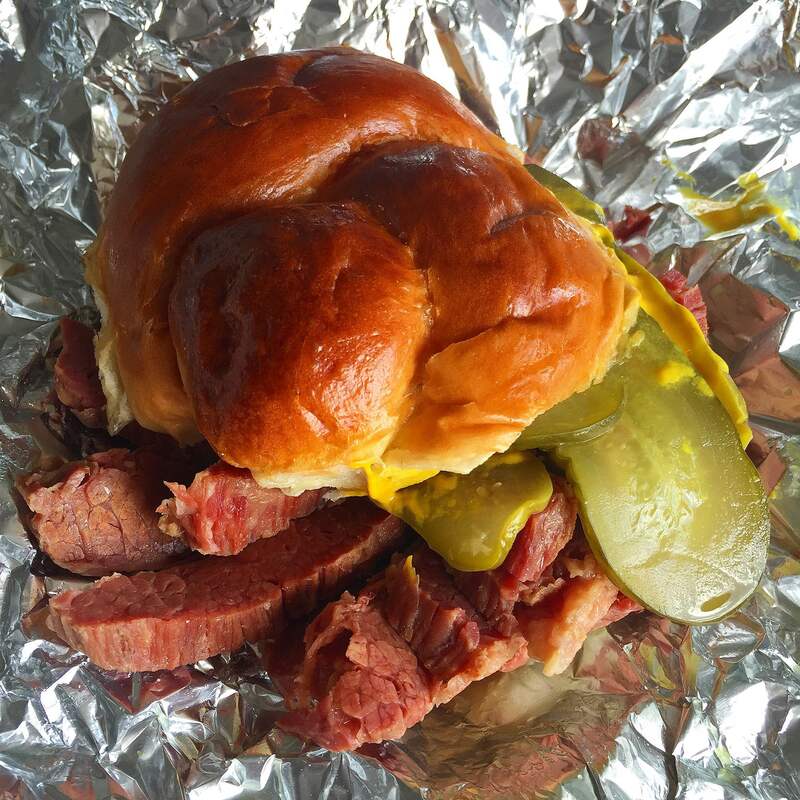 This has to be the best salt beef in London right now. Easily. Sorry Selfridge’s, sorry Monty’s, sorry…actually Beigel Bake isn’t really about the quality of the salt beef, is it? Anyway, sorrys all round. Forget about all others. Eat Delancey dust, etc. etc. The pickles are excellent, by the way. Did you think they wouldn’t be? Ha, fool! They make those, of course, and you can get sweet n’ sour, salty or New Green (NYC half sours – seasonal). I get a mixture of sweet n’ sour and salty in my sandwich. Do that. Sometimes I get a slice of Swiss. That’s not really necessary. CONS: Well, I say ‘cons’ but really I just need something to write here. The menu can be a little overwhelming at first, with so many options for ‘load ups’ but it’s not, once you get started going there every week. What? The smoked salmon is worth a try, too. I like it on a plain bagel with chive cream cheese schmear and seaweed. Bonus picture at the end. I love Delancey and Co. so much I just did a little spontaneous rap about them. Here it is. Can’t spend enough of my dough, getting your beef into my face hole.